Spectacular house designed by a renowned architect has 12,245 square feet and its rooms are divided into entrance hall, two living rooms, dining room (all social area floors are marble and has central air conditioning, besides to illumination project), media room, breakfast room, half bathroom, open verandah, internal garden, private room, five en suite bedrooms, the master suite with private garden, two separate closets, bathroom with whirlpool and an exclusive sauna, kitchen, eating area, pantry, dish cabinet, service area and laundry. Its external area has extensive swimming pool, steam glazed sauna, barbecue area, fitness room, whirlpool and external eating area. 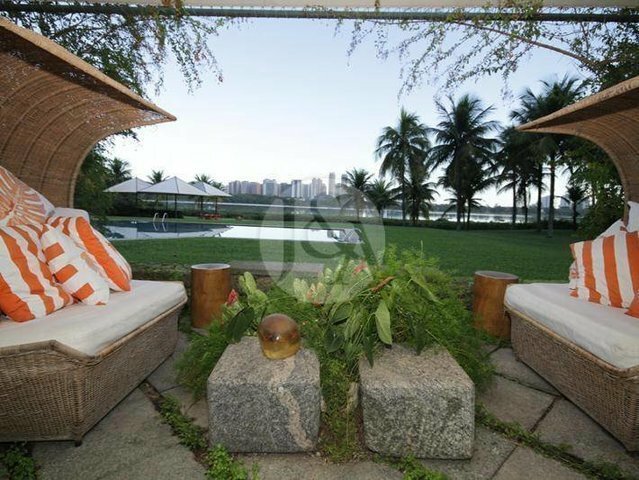 The 4.20 acres land also counts with garden with landscaping and night lighting project, soccer field, caretaker's house, lake, helipad and possibility of nautical deck with direct access to Tijuca’s lake. Garage for several cars. Property in perfect conservation state.